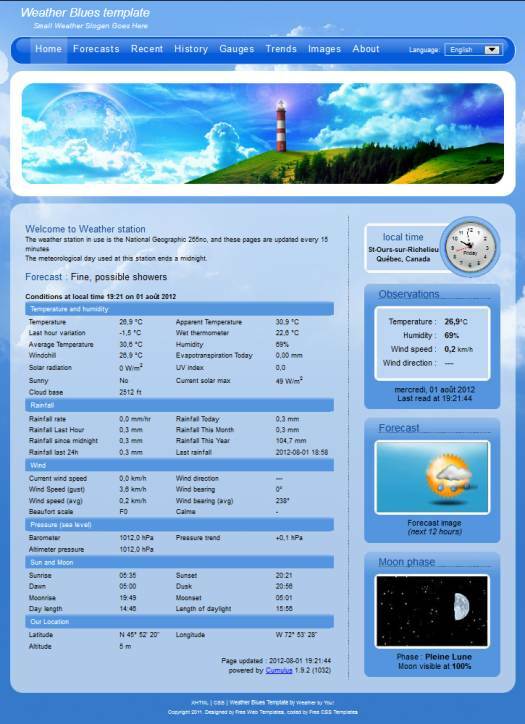 Weather Blues template is composed of many files and folders. After extracting the archive content in a folder, you should have the folder listing content as shown beside. Some other files are not listed in order to condense this listing. dbimages - This folder contain all images for Cumulus usage. images - This folder contain all your images. style - This folder contain all the layout of your template. empty.php - This page is a blank one already formatted for your needs. gauges.php - This page contain gauges display. header_menu.php - This file contain main menu. images.php - This page contain an image slideshow to show your location. index.php - This page is your template main page frame. index_txt.php - This is the content of index page. infos.php - This page contain informations about your station (menu: About). manage.php - This is your template updater module (details on this link). records.php - This is the all-time records page container. records_txt.php - This is the content of records page. station.php - This page contain infos about units of measures and other infos. station_txt.php - This is the content of page station. style.css - This file contain layout informations. system.php - This is the supervision page containing status of your station. System_txt.php - This is the content of system page. thismonth.php - This page contain all infos about current month. thismonth_txt.php - This is the content of thismonth page. thisyear.php - This page contain all weather infos about the current year. thisyear_txt.php - This is the content of this year page. today.php - This is the page for today's observations. today_txt.php - This is the content of today page. trends.php - This page contain all weather graphs trends. webcam.php - This page is a model you can use if you have a webcam. wt_data_intl.php - Data file; International character support (Utf-8). wt_data_inc.php - This file is the only one to be processed by Cumulus. yesterday.php - This page contain all weather observations for yesterday. yesterday_txt.php - This is the content of yesterday page. This template is composed of many parts that the server assemble before sending it to the visitors. Let's see, in a simplified way, what is happening on the server! Take for example your main page: index.php. Your provider's server open the file and reads it's content, line by line, exucuting all "commands" in index.php. Starting by trying to set the default language to use, server goes to lang folder and open the selected language, read it and remembers all the (translated) words. Then, the second command it enconters tell the server to include all lines of file wt_data_inc.php (weather data from Cumulus) and remember them all too. Then, it detects a demand to include file header_menu.php; this file includes 3 parts: First 2 line four your site name and slogan, language selector and main menu. Finally, it begins to write some titles and prepare the layout for including the index_txt.php file. This file contain the center page; weather infos from Cumulus data file, which has been read previously. Finally, the server is ready to send the result of the "work" that has been done! When we see all that processing, we could think: "Why doing it all so complex"? But complexity is synonym of "power" and "versatility". Think of it like this: having to modify just 1 file when we want to add a new item to a menu is prettty simple compared to editing all pages of a site! Also, take the language for example: If you want to create a multilingual site, you have to duplicate all files in your site for each new language you want to add. Then figure out that your site has only 15 pages you want to translate to 10 other languages (15 pages x 11 languages = 165 pages!)... and don't forget to verify all links used inside each page!! One thing that you have already heard about, the CSS principle: separate layout from content! Imagine that in this site, I decided that I don't like those big green titles anymore and I want something fancier for font. I have to edit ALL pages from my site to revise pages entirely, to find all places where I use that title to change color and font! (my most complete site had more than 150 pages, what a job!!). Then CSS is there for that reason. Change color and font in 1 place... and like "magic", all pages are modified without editing any of them! Then web languages, like php, allow to extend that phisolophy to all parts of a web page. If we turn back to Cumulus, how many new calculations or improvements it launches (=builds) in a single year? If you've worked hard to customize your site in a unique way and your template imposed to replace an entire page for any correction/addition... will you install each version of both Cumulus and the template? Or will you do less refinements? Weather Blues template works that way! You will find that practically all weather pages have their TXT conterpart (eg. index.php and index_txt.php). Then you can customize the .php in any way that you want, adding as many refinements that you can think of, like "I'll try to update this files as rarely as I can!" But, never modify a file ending with _txt.php as I'll keep then alive by including news from Cumulus as fast as I can! Copyright 2009 - Green Earth. | Web Design Company : Ray Creations. | Adaptation : Weather by You.